WHO ARE THE PEOPLE OF GOD? DID BIBLICAL PROHETS TEACH ALIKE? WHERE WAS THE ORIGIN OF MAN? WHAT IS THIS THING CALLED “SAVED”? “Seek ye first the kingdom of God.” (Matt. 6:33) The gospel is the gate into the kingdom of God. “For I am not ashamed of the gospel of Christ: for it is the power of God unto salvation to every one that believeth; to the Jew first, and also to the Greek.” (Rom. 1:16) The key to the gospel is the Melchisedec Priesthood. Jesus was first ordained to the Melchisedec Priesthood before He could preach the gospel. He then ordained others with this divine authority. “And I will give unto thee the keys of the kingdom of heaven: and whatsoever thou shalt bind on earth shall be bound in heaven: and whatsoever thou shalt loose on earth shall be loosed in heaven.” (Mark. 16:19) As an Elder with a valid claim to the Melchisedec Priesthood, I send this special invitation to you. The greatest duty we owe to ourselves and our families in this mortal life is to know God, understand His will, and secure our salvation in eternity. We all lived together as spirits before living in this mortal flesh. Our works during this first estate determined spiritual opportunities now. This life is like a snap of the fingers when compared with eternity. Jesus is actually the savior of all men. “For therefore we both labour and suffer reproach, because we trust in the living God, who is the Saviour of all men, specially of those that believe.” (1 Tim. 4:10) All men will receive an immortal physical body in either the resurrection of the just, or the resurrection of the unjust. “Then said one unto him, Lord, are there few that be saved? And he said unto them, Strive to enter in at the strait gate: for many, I say unto you, will seek to enter in, and shall not be able.” (Luke 13:23, 24) “Enter ye in at the strait gate: for wide is the gate, and broad is the way, that leadeth to destruction, and many there be which go in thereat: Because strait is the gate, and narrow is the way, which leadeth unto life, and few there be that find it.” (Matt. 7: 13, 14) “Nevertheless when the Son of man cometh, shall he find faith on the earth?” (Luke 18:8) The goal of this tract is to bring an awareness of the importance of knowing God and obeying His will TODAY. If there is one other requirement to inherit eternal life, this doctrine is false and can never lead you into the kingdom of God. “From that time Jesus began to preach, and to say, Repent: for the kingdom of heaven is at hand.” (Matt. 4:17) “Jesus answered, Verily, verily, I say unto thee, Except a man be born of water and of the Spirit, he cannot enter into the kingdom of God .” (John 3:5) “Then Jesus said unto them, Verily, verily, I say unto you, Except ye eat the flesh of the Son of man, and drink his blood, ye have no life in you.” (John 6:53) “And he that keepeth his commandments dwelleth in him, and he in him. And hereby we know that he abideth in us, by the Spirit which he hath given us.” (1 John 3:24) Here are five other things that must be realized to enter the kingdom of God. You cannot be a member of the kingdom of God without obeying each of these laws. If you are able to understand the truths in this tract, you were a very special person when we all lived together as spirits. But, only a few are ever called of God to enter the kingdom in the flesh. “Nevertheless when the Son of man cometh, shall he find faith on the earth?” (Luke 18:8) The rest are preached the gospel after death. “By which also he went and preached unto the spirits in prison.” (1 Pet. 3:19) You could be among the few that will be found acceptable when Jesus returns in this generation. Let us discover how. Jesus could not take the power or authority of the priesthood upon Himself like modern divines presume to do. “Thou shalt not take the name [authority] of the LORD thy God in vain; for the LORD will not hold him guiltless that taketh his name in vain.” (Ex. 20:7) The Apostle Paul reminded his son that only those called by the spirit of prophecy and ordained under the hands of one holding that priesthood are recognized by God. “14 Neglect not the gift that is in thee, which was given thee by prophecy, with the laying on of the hands of the presbytery .” (1 Tim. 4) Aaron was called through a revelation given to Moses. Moses held a higher office; and therefore held authority to ordain him. Why did Jesus go to John? John was a Priest of the Levitical Priesthood; and held divine authority to baptize with water. Jesus said of John, “For I say unto you, Among those that are born of women there is not a greater prophet [preacher] than John the Baptist.” (Luke 7:28) John, though, did not hold divine authority to baptize Jesus with the Holy Spirit; as many so-called ministers of today presume to take upon themselves. The kingdom of God has specific officers that are given power to be administrators of the gospel and kingdom. These possess the power of the gospel. Ordinances performed by anyone who has not been properly called of God by the spirit of prophecy and ordained under the hands of one holding that priesthood are void. Let us say there was a certain man who desired to be Sheriff of a certain area. Although he was not properly elected and sworn into office, he presumed to hold that office. How do you think the properly established authorities would treat him? Jesus will treat those who take the name (authority) of God in vain the same way. “Many will say to me in that day, Lord, Lord, have we not prophesied in thy name? and in thy name have cast out devils? and in thy name done many wonderful works? And then will I profess unto them, I never knew you: depart from me, ye that work iniquity.” (Matt. 7:22, 23) There is a place called the spirits in prison for these. Jesus gave this power of the kingdom to those whom He ordained. “And I will give unto thee the keys of the kingdom of heaven: and whatsoever thou shalt bind on earth shall be bound in heaven: and whatsoever thou shalt loose on earth shall be loosed in heaven.” (Matt. 16:19) Only these officers have their ordinances recorded in heaven. If you were not born of water and the Spirit through one holding the Melchisedec Priesthood, you are not a member of the kingdom. The power of the gospel or keys of the kingdom were held by divinely called and ordained officers from Adam to Abraham. These were all officers of the Melchisedec Priesthood. The name of this priesthood was changed in honor of Melchisedec—who some believe was Shem, the righteous son of Noah. There are only two orders of the priesthood called of God: (1) the lower Levitical or Aaronic, and (2) the higher Melchisedec. The Levitical Priesthood was first introduced by Moses. Its officers include Priests, Teachers, and Deacons. Their priesthood is for life. How does a person become a citizen of the U. S.? Does he not have to be naturalized by an officer of the government having authority to perform that act? Could he become a citizen simply by reading of its wonders, by desiring to be a citizen, and accepting the President? Only properly called officers in the kingdom of God have divine authority to have their ordinances recorded in heaven. No man can claim authority based on that held by another. Each calling and ordination is individual and specific. The ordination of Moses did not affect the ordination of Jesus. The ordination of Jesus did not affect that of the twelve Apostles. The ordination of the Twelve did not affect the ordination of Elders in every church. John saw the apostasy of the Gentiles, told of the Church of Christ being taken from the earth, and Satan being given total power over all the souls of man for 1260 years. Rome fell in 476 AD; but rose again as the Papacy in 570 AD. The Papacy was established in 570 AD. When we add the 1260 year complete apostasy, the result is 1830. 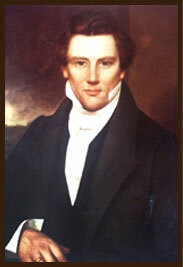 Joseph Smith organized the Church of Christ, according to the law of the land, on April 6, 1830. He claimed to have been ordained an Apostle, Prophet, and Lawgiver like Moses and Jesus. He established the same organization in the church; as Jesus before him. “And he gave some, apostles; and some, prophets; and some,evangelists [High Priests]; and some, pastors [Elders] and teachers.” (Eph. 4:11) If Joseph Smith did not restore the Melchisedec Priesthood, not one person has entered the kingdom of God since the time the Melchisedec Priesthood was lost and baptism was changed to sprinkling. 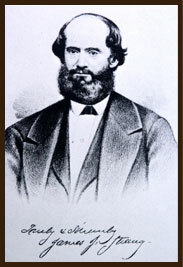 At the same hour Joseph was murdered on June 27, 1844, James J. Strang (some 400 miles away) claimed to have been ordained the same as Joseph, under the hands of angels, to the office of Apostle, Prophet, and Lawgiver. This prophesy of the end of the last Gentile dispensation of the gospel was fulfilled after the six day war in 1967. The times of the Gentiles is over. We are now in the last generation that is to continue until the return of Jesus. Only a very few are to enter the kingdom during this time. “I tell you that he will avenge them speedily. Nevertheless when the Son of man cometh, shall he find faith on the earth?” (Luke 18:8) He will return before the end of this last generation, possibly near 2007. Many parts of Scripture indicate this last generation will be forty years; but, we cannot say with absolute certainty. No man knows the day and the hour. An overflowing scourge that will put an end to all nations has been promised for this generation. “And your covenant with death shall be disannulled, and your agreement with hell shall not stand; when the overflowing scourge shall pass through, then ye shall be trodden down by it. From the time that it goeth forth it shall take you: for morning by morning shall it pass over, by day and by night: and it shall be a vexation only to understand the report.” (Isa. 28:18, 19) But, all is not lost. James J. Strang was ordained under the hands of angels as an Apostle, Prophet, and Lawgiver—like Moses, Jesus, and Joseph Smith before him. He ordained Apostle L. D. Hickey, who ordained Samuel Martin a High Priest, who ordained Lloyd Flanders a High Priest, who ordained Samuel E. West an Elder. In the joys of a vast paradise? Go with me. What the Lord has prepar’d for the just. Go with me. the life is eternal with God. Go with me. Death, the wages of sin, is not there. Go with me. Your invited to go with us.